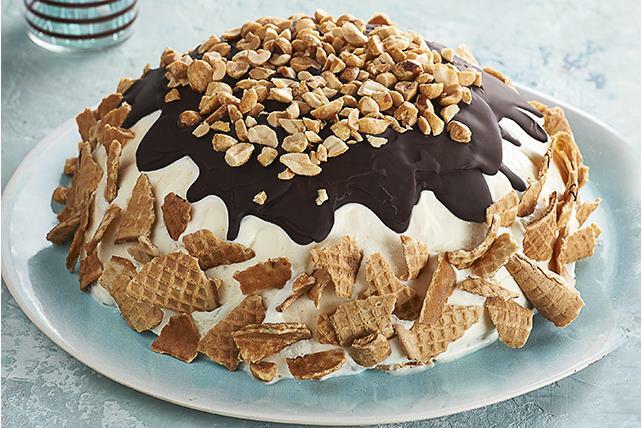 Scream for ice cream--cake!--with our Sundae Cone 'Cake' recipe. There's nothing better than a Sundae Cone 'Cake' made with real ice cream and sugar cone. Use back of spoon to pack ice cream into foil-lined 1-1/2-qt. bowl. Crush 4 sugar cones; sprinkle over ice cream. Press gently into ice cream to form even crust. Freeze 4 hours or until ice cream is firm. Unmold dessert onto plate; remove foil. Break remaining cones into pieces; press into side of dessert. Melt chocolate as directed on package just before serving dessert. Stir in oil; cool slightly. Drizzle over dessert; sprinkle with nuts. This deconstructed ice cream cone "cake" is a fun dessert to make and share with a crowd. The melted chocolate needs to be cooled slightly (as directed in recipe) before drizzling it over the unmolded frozen dessert to prevent the ice cream from melting. The chocolate will harden almost immediately after drizzling it over the dessert. This fun dessert can be frozen up to 3 days. Let stand at room temperature about 10 min. to soften slightly before serving. Warm a long sharp knife under running hot water, then shake knife gently to remove excess water. Use warm knife to cut the frozen dessert into wedges.